And I gave that life for you. When the United States of America began using canines in combat, there was no going back. It was a decision which would change the course of war forever more, allowing troops to use animal companions in order to accomplish tasks which a human would normally have difficulty doing otherwise. In the beginning, over 30 different breeds were utilized for the war efforts, including but not limited to Airedale Terriers, Boxers, Shorthaired Pointers, Water Spaniels, and even Poodles. However, it was quickly discovered that certain breeds were better equipped for combat than others. Great Danes, for instance, proved to be excellent hunters due to their incredible sense of smell but were difficult to train because of their size and the fact that they were easily distracted. 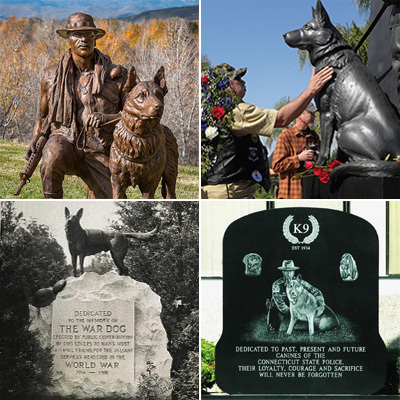 By the time World War II rolled around, the list of acceptable breeds had been limited down to only five: German Shepherds, Belgian Sheepdogs, Doberman Pinschers, Smooth Collies, and Giant Schnauzers. Others breeds, such as the Malinois and Retriever, were added later as the United States military came to discover their abilities. World War II was an important time for war dogs. Well over 11,000 canines had been procured and trained by the U.S. army – an impressive amount when one considers the mere 100 that had been enlisted for World War I. These four-legged soldiers were trained in one of seven roles, depending on their size, intelligence, and prowess. Attack Dogs were the most popular at the beginning of the war and they were trained to apprehend individuals; Tactical Dogs were used purely on an experimental basis in order to test camouflage material and gas masks; Scout Dogs (commonly known as Sentry Dogs) were meant to scan the surrounding area and alert their human counterparts to anything suspicious; Messenger Dogs were the primary means for soldiers on the battlefield to receive messages or packages, though they were being quickly replaced by walkie-talkies and other means of communication; Tracker Dogs (commonly known as Search And Rescue Dogs) worked alongside the medical corps and aided in finding wounded soldiers on the battlefield; Sledge Dogs were trained to navigate snow-heavy regions and to locate any missing persons who may have been buried or lost in the snow; Pack Dogs were similar to Messenger Dogs except for the fact that they were trained to transport heavy equipment, including small machine guns, ammunition, and crates of food. 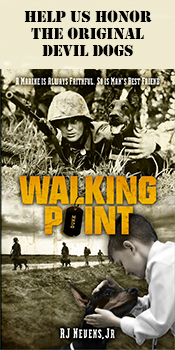 The Vietnam War was a crucial point for dogs of war. Many of the roles canines were used for in World War II were dropped altogether and only the Working Dogs, Scout Dogs, and Tracker Dogs made a comeback. However, an additional job had been added as technology worldwide grew. These new canines were known as Detection Dogs and they were commonly used in order to locate mines, hidden tunnels, trip wires, and booby-traps. Although only 3,750 dogs have been recorded as being sent with troops overseas, it is believed that close to 5,000 canines were actually trained. The grim truth behind these numbers comes to light when one realizes that only 204 dogs made it out of Vietnam. While some of the heroic dogs were killed in combat, most were either euthanized or left behind, treated as nothing more than equipment to be tossed out. Thankfully, that is no longer practiced and today's returning war dogs are frequently adopted stateside by their handlers or handlers' families. These four-legged soldiers aren’t just working alongside the United States military, they have also been trained to help in various other ways. Law enforcement, first responders, and even fire departments have enlisted the help of canines. Police departments tend to train German Shepherds and Malinois for general K9 detail, Retrievers for narcotics and explosive detection, and Bloodhounds for search and rescue. Other mixed breeds may be used as well, but these are the four most common due to their intelligence and ability to do their job well. First responders have less restrictions on which breeds can be used, mostly because these canines work as therapy dogs to help people cope after a trauma. Search and Rescue dogs may also be used by first responders to help locate individuals who have been lost in a disaster. Fire Dogs, or those canines who work with fire departments, used to help guide horses which would draw the firefighters’ carts of water. Nowadays, Fire Dogs are used as mascots and to locate any accelerants which may have been used to start a fire. With training similar to that used in the military, these canines can help subdue a dangerous individual, locate a missing person, and identify hazardous material. C) Enough of the background to identify the location. Your motorcycle is NOT required to be in the picture if doing so is impractical or unsafe. An additional photo with rally flag and motorcycle as close to the memorial location as possible when you are unable to get all in same photo. Some of these memorials are part of a larger memorial. No parking on sidewalks or lawns, unless given permission by caretakers or law enforcement. Only one credit will be allowed per memorial, and only one per location. TOH scorers will have final say whether a site is allowed or not. ©2018-2019 Tour of Honor, LLC. All rights reserved.